It had been a long time since I last made muffins and I had been seeing some nice ones around the food blogging sphere. Elle from Elle’s New England Kitchen recently made some blueberry and lemon and raspberry and lime muffins that caught my attention. Although blueberry and lemon is one of my favorite combinations for muffins it was the raspberry and lime ones that I was most interested in. I had not tried the raspberry and lime combo and it sounded like another good one. The locally grown raspberries had been looking good lately and it was time to try the muffins. The raspberry and lime muffins turned out good! The were nice and light and moist and the pockets of raspberries in the middle were wonderful. I really liked the raspberry and lime flavour combination. With all of the fresh berries around I am looking forward to making more muffins. When making a blueberry and lemon coffeecake I like to pour sweetened lemon juice over the coffeecake followed by some sugar after it is done baking. I then pop it under the broiler until the sugar bubbles. This infuses the coffeecake with more moist lemony goodness and the melted sugar forms a crispy layer on top which is really nice. I used the same method with lime juice for these raspberry and lime muffins. Unfortunately it did not work out as well as I had hoped with the muffins. The muffins were starting to look too dark before all of the sugar on the top had melted and I had to pull them out of the oven. Oh well, the partially melted sugar topping was still really good. Next time I will have to pull the muffins out of the oven a little earlier before adding the topping. Beat in the eggs, vanilla extract and lime zest. Spoon the mixture in to a greased muffin pan. Bake in a preheated 375F/190C oven until a toothpick inserted into the center comes out clean, about 20-25 minutes. Mix the lime juice and zest with the icing sugar and pour over the muffins. Sprinkle the muffins with the sugar. Broil the muffins until the sugar on top bubbles, about 2 minutes. Be careful and watch them to make sure that they do not burn. 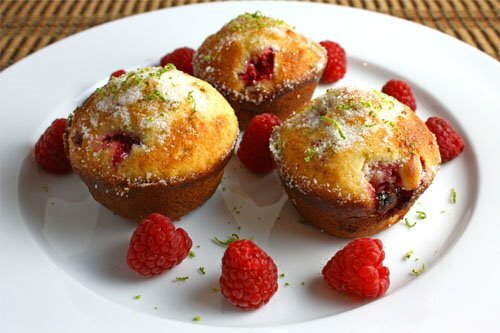 I love raspberries in muffins, and lime is always a favourite with me! I’ll have to try them! They look very good. The lime is interesting. I will have to try that next time. Thanks for the tip regarding the blueberry lemon coffee cake. I plan on making one of those soon. I’ve never baked with limes before – how sad is that?!?!?! Thank you for reminding me how much I NEED to do so!! Those muffins sound heavenly. I’ve said it before and will say it again …. I love berries! The muffins look yummy! Um! Lime and raspberries! Sounds really good! Lovely! I love lime with fruit also. These muffins must taste incredible. I love the combination of flavors and the texture on those pictures looks perfect. These look great. Loving the berry muffins right now. That combination of flavors sounds good! This is actually a combo I never considered, it sounds great and looks even better. Whoa! Your muffin looks alluring, too! I will give it a try.. Thanks for sharing..
Yummy… I have a similar recipe but using ricotta cheese, which gives a nice texture to it. Great pictures and what a lovely recipe Kevin. Now that is a great combo and your photo just explodes off the screen – what a great summer combo!! A great combo – Raspberry and lime – YUMMMO!! They look really nice. I’ve never made muffins. After seeing these I will have to give them a go. Those look delicious! Sounds like a wonderful flavour combination. I like that topping idea for coffee cakes, I’ll have to remember that one! Hey – what’s up my brother from another mother!!! This looks good – but you know what would have been better?!? A lime raspberry cream cheese frosting on top, of course! Great job w/this though. Sounds like a perfect combo of flavours – really refreshing and summery. Gotta try these! I really like the idea of infusing the baked good with some lime based simple syrup to amp up the lime presence. Every time I experiment with using lime flavor in baked goods I wind up either with something much too tart or with something where the lime is just…wimpy. I think your syrup idea might be a good fix for that. what a great combination! that looks wonderful! Looks so darn good Kevin. I can’t really tell that the topping didn’t turn out as expected! The muffins still look fantastic! Yum! I’ve been stopping by here regularly for months now and everything you make looks so tasty. If I weren’t so lazy, I’m sure this blog would have motivated me try some of your recipes. I think I have a solution, though. You should open up a drive-thru window at your place. I’d be a regular customer! Beautiful pic with the melted butter. They look great. Yum! I’m liking the look of those muffin innards! The slash of red is so appetizing! love raspberry and lime together! have you tried a kitchen torch for the top instead of the broiler? maybe that would work? beautiful as always kevin! your muffin look good!! I must try raspberries in muffin or cupcake now since it’s berries season! !want to grab one right now on my screen!! Those look yummo Kevin! I must get me some of them! Looks super yummy! I’m definitely nicking this for the next time I make muffins — which will be over the weekend. Wow…these look great! The combination of raspberry and lime sounds wonderful. You know, I couldn’t tell you had a problem with the topping Kevin. Looks amazing as usual! I especially like the combination of raspberries and lime. A must try for sure. Raspberry and lime is a favorite combo of mine. I was eyeing these on Elle’s site, too. Yours look great. Sorry the topping didn’t work out just as planned but they still look–and no doubt taste–amazing. The muffins looks so delicious and moist, almost as if there was a piece of white chocolate hidden in there somewhere…. Those are such pretty muffins Kevin! The combo sounds perfect! I dreamed about raspberries tonight. I was holding a big bag of beautiful fresh ones and was very disapointed when I woke up to find out I didn’t have them… I wish I did to make these beautiful muffins! Never thought to use the lime; good thinking. Kevin, wonderful photos! A lime syrup on baked goods gives is a treat. Kevin, they look incredible! Oh my gosh, I can’t even tell that the topping didn’t turn out the way you wanted it to. Thanks for the shout out! Just when I’d thought I’ve seen enough muffins, you make these and they look REALLY good. Printing this one off. Our raspberry season seems to be over, but we’ll see. That flavor combo sounds wonderful! I’m going to have to try it soon since raspberries are looking really good here, too. I have been wanting to try Elle’s muffins, and yours look great as well!! I’ve never heard of adding the sweetened juice like you were saying – I’m so intrigued! They look so good Kevin… I have never had the raspberry/lime combination and it sounds really good. Great photos! Raspberries in muffins taste like candy to me. Delicious! The combination of raspberry and lime is so inviting and I won’t even complain if the topping isn’t exactly perfect. If you wouldn’t mind delivering, I’ll so shower you with praise if you turn up at my door with these treats. Muffins are the best! You can do so many things with them, and they work with any meal of the day! That’s a great idea of pouring the citrus over the top and sprinkling on the sugar. Something like that would probably be good on banana bread. Kevin, please drop by my blog because I have tagged you. Love this combination Kevin! These look like such a treat! That looks delicious Kevin! I realized the other day your blog is better and more popular than Coconut and Lime, who is supposedly the big food blogger! Good for you! this looks great! i want to make this for a breakfast one day! i love berries and lime!!! Once again I have been away from the computer and am now catching up on your latest posts. I must try these! It’s been a while since I have made muffins. 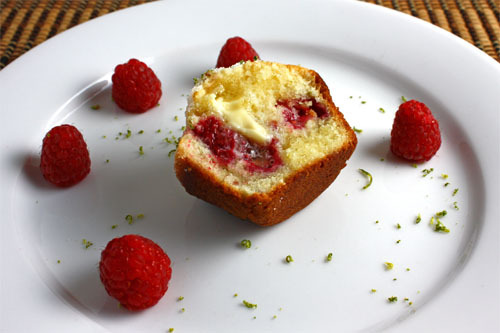 raspberry and lime muffins… oh yes! Kevin, I think I need one of these right now. What an awesome combination.Lime and Raspberry,very unique. What a stunning combo Kevin and great looking muffins!! OMG! Very simple and fantastic taste! Best recipe muffin ever. The worse part was to infuse the muffins with the lime+sugar juice… what a mess! Ahhh, so great! I baked these for a bake sale for my husbands university having never baked them before & he came home saying they were a hit!! I'm making a double batch right now & I can't wait! The batter tastes amazing!! !